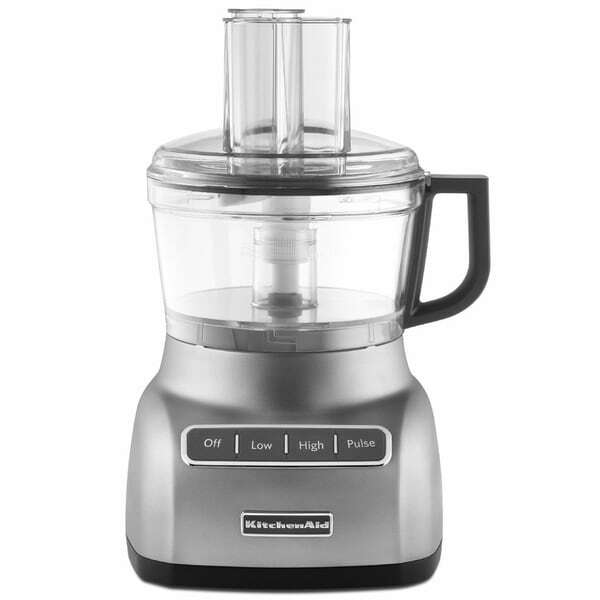 Love this food processor it is so light weight and chops beautifully, easy clean up a great buy. Slice, shred, knead, chop and more quickly and easily. This 7-Cup Food Processor with ExactSlice system slices everyday portions of fresh fruits and vegetables from thick to thin. High, Low and Pulse speed options allow you to precisely and properly handle soft or hard ingredients with the touch of a button. The 2-in-1 Feed Tube lets you use either the large or narrower opening during continuous slicing or shredding, depending on the size of the ingredients. Food pushers help you guide ingredients into the discs. The UltraTight Seal Features a specially designed locking system with leak-resistant ring that allows you to fill the work bowl to capacity with ingredients without worrying about making a mess. Easy to use, perfect size - smaller than my former monster 13 cup, and larger than the tiny 1 1/2 cup - this one is just right. Impressed with the quality of the blades and ease of switching the blades. I appreciate the modern sleek styling of this unit as well. but due to other positive reviews I went ahead and got it. The food processor looks brand new and works like a charm! I have used it a handful of times and am thrilled to have the right tool for the recipes I was formerly making in my blender. This is a strong motor, very quick, versatile and easy to clean. 2 thumbs up! This is a handy little device! Don't let the 'refurbished' scare you away from i) a bargain, and ii) an awesome little helper for the kitchen! 7 cups are a perfect size. I didn't know this before I got this 7-cup food processor. I had one of those humongous feed-an-army sized food processors that worked quite well, but....drumroll....she's breaking out with the (gasps) FOOD PROCESSOR! Heave-ho! Not this one, at all! It comes with neat attachments/gadgets and (++) an 'adjustable' slicer. THAT right there makes me want to just go ape nuts and start slicing stuff. I find myself looking for things for which I can use this nifty little puppy! It's nice for a single person or small family! Nice to have a option of more attachments in this size. I had some concerns about if being a refurb. It works great so far. Just like new (maybe better). Excellent machine and lighter weight than my 16 cup kitchen aid processor. I Like this 7 cup and use it often. It is quick and simple to use. The accessories are very useful and a snap to change out. Highly recommend this processor. Purchased this because it appears to be the only mini food processor with a slicing and shredding disc. My Kitchenaide mini finally gave out. This product is very cheaply made of light weight plastic. I don't know how long it is going to hold up. I would not recommend this. Was hesitant, at first, to purchase a refurbished item, but have not been disappointed. It is just the right size for us. We've only used the large blade so far, but it has done well. Just like all food processors, you have to stop it periodically to make sure that all the food on the edges gets incorporated. I would purchase it, again. It does not work at all. I usually do not write bad reviews but this is the first time I ever purchased something new or used that does not work at all. I plugged it in and nothing. I thought it might be the outlet but I tried 5 outlets. Bought as a anniversary gift for my mom and she loves it. Easy to use, Easy to clean!!! That's a plus. Should got the bigger one but for a small kitchen this work hoarse will do you right. Kitchen Aid styling as well as a solid warranty at half the money. What is there not to like ? "Does this processor mix dough for breads,pasta?" mine is chipping at the cup and is the 1,5 cup. Gets clogged at the base. I have a 14 cup but i need a smaller one for certain things. "does this come with more than one blade attachment? Specifically, will it both shred and slice? Thankyou"
hello coloradocarole, This food processor comes with a multi-purpose blade, adjustable slicing disc and reversible shredding disc. I hope you found this information helpful. Thank you for shopping with us.